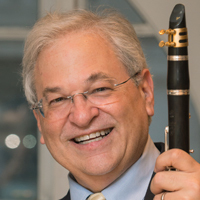 One of only three wind players to have been awarded the Avery Fisher Prize since its inception in 1974, David Shifrin is in constant demand as an orchestral soloist, recitalist, and chamber musician. He has appeared with the Philadelphia and Minnesota Orchestras and the Dallas, Seattle, Houston, Milwaukee, Detroit, Fort Worth, Hawaii, and Phoenix symphony orchestras, among many others, as well as orchestras in Italy, Switzerland, Germany, Japan, Korea, China, and Taiwan. He has also received critical acclaim as a recitalist, performing at such venues as the Library of Congress in Washington, DC, and Alice Tully Hall, the 92nd Street Y, and Carnegie Hall’s Weill Recital Hall and Zankel Hall in New York City. As a chamber musician, he has frequently collaborated with such distinguished ensembles and artists as the Emerson String Quartet, trumpeter Wynton Marsalis, and pianist André Watts. An artist of the Chamber Music Society of Lincoln Center since 1989, Mr. Shifrin served as the organization’s artistic director from 1992 to 2004. He has been the artistic director of Chamber Music Northwest in Portland, Oregon, since 1981, and he is the artistic director of the Phoenix Chamber Music Society Winter Festival. In addition, he has served as principal clarinetist with the Cleveland Orchestra, American Symphony Orchestra (under founder Leopold Stokowski), Honolulu and Dallas Symphony Orchestras, Los Angeles Chamber Orchestra, and New York Chamber Symphony. Mr. Shifrin joined the faculty of the Yale School of Music in 1987, and he is the artistic director of the Chamber Music Society of Yale and Yale’s annual concert series at Carnegie Hall. He has also served on the faculties of the Juilliard School, University of Southern California, University of Michigan, Cleveland Institute of Music, and University of Hawaii. In 2007, he was awarded an honorary professorship at China’s Central Conservatory of Music in Beijing. David Shifrin performs on a Backun cocobolo wood clarinet made by Morrie Backun in Vancouver, Canada, and uses Légère reeds exclusively.